Quentin Dujardin & Resonance are on tour. More info and booking now! 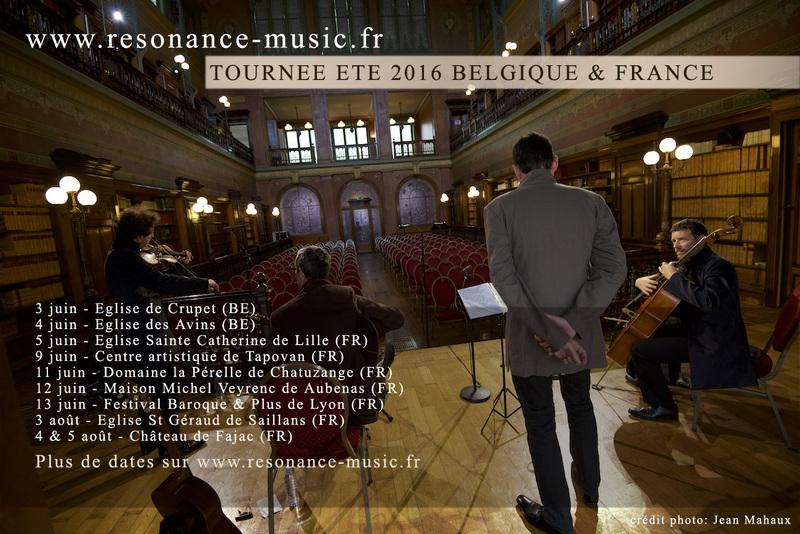 Quentin Dujardin & Resonance will perform at the Church of Beguinage (Brussels) this next May, 8. More info and booking now! 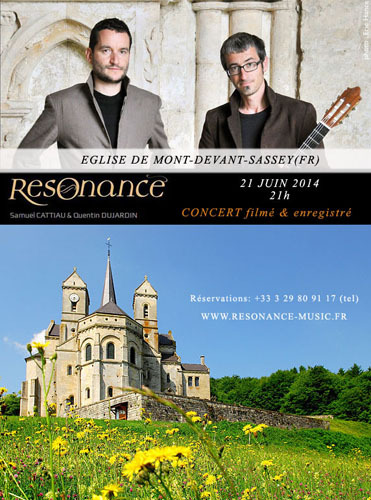 The new album of Resonance untiltled Illuminations will be performed at the Abbey of Noirlac (FR) this next July,14. Book now your seat for this concert! 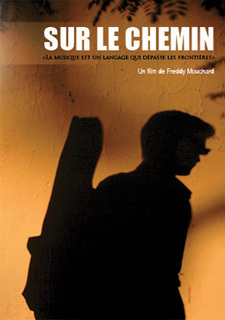 10 years ago was released the musical documentary "On the way" about Quentin Dujardin and his way to travel with his guitar. The full version of this road movie is now available in streaming. Quentin Dujardin will be touring from February with Ivan Paduart. They will play the music of Catharsis, their latest album. 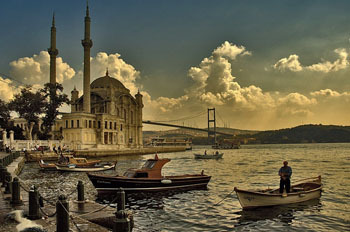 Don't miss the tour and get more information here! Quentin Dujardin will celebrate his bithday at Le Palais des Beaux-Arts of Charleroi on November, 17 2017. Don't miss the night and book now! 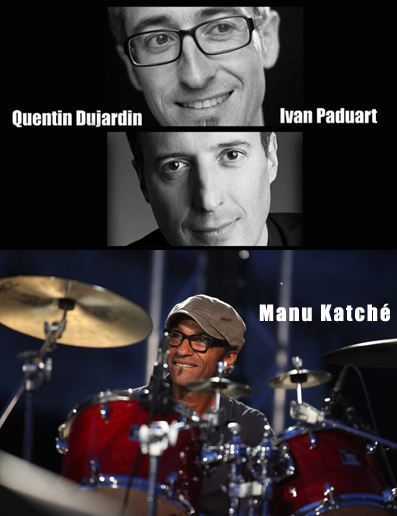 Quentin Dujardin will be on May 28 at Festival de Jazz of Dudelange (LUX) with Ivan Paduart and Manu Katché. Ialma and his brand new album Camiño is now broadcasted on every national and international Spanish radios. Quentin Dujardin will be on tour with the Galicians singers. The guitarist produced their album. "Amazing brand new album"- JAZZ MAGAZINE (FR). 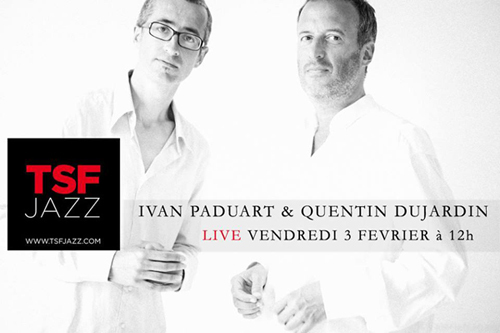 Listen now to the interview of Quentin Dujardin & Ivan Paduart son TSF Jazz (FR). Passionate about writing, Ivan Paduart & Quentin Dujardin create finely crafted lines that feature their own universes, the pianist's jazz world and the unclassifiable style of the guitarist. Their desire to further pursue this adventure now leads them to record this new album, Catharsis alongside Manu Katché, Richard Bona, Olivier Ker Ourio and Bert Joris - artists that don't need introduction - they have created a work that will delight many ears. Buy it now by clicking on the cover! 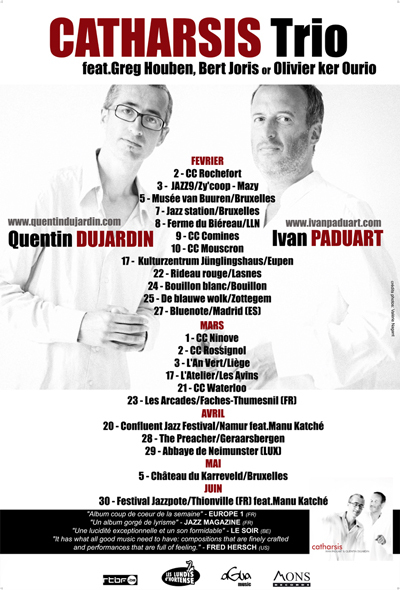 Quentin Dujardin & Ivan Paduart will perform 2 concerts in France in September. 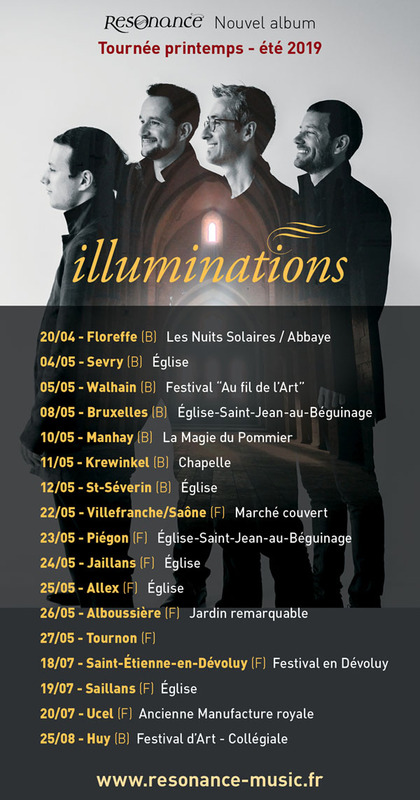 They will be the 3th at the Church of Mont-devant-Sassey (FR) and the 4th at Avioth (FR) with Jalal El Allouli (vocals & violin). Book now! 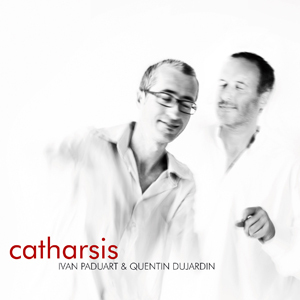 Before the release of CATHARSIS, the new album of Quentin Dujardin & Ivan Paduart scheduled for October 7th, check this video live at ICP Studio with Manu Katché & Richard Bona. 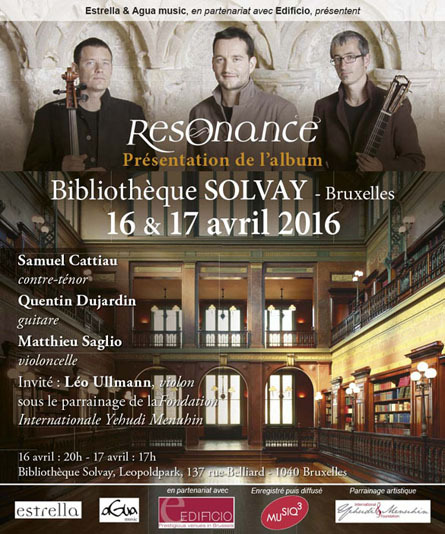 Book now your tickets for the 2 special nights at La Bibliothèque Solvay of Brussels. 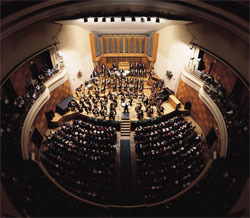 The concerts will be recorded and broadcasted by Musiq3 for the Belgian National Radio (RTBF). 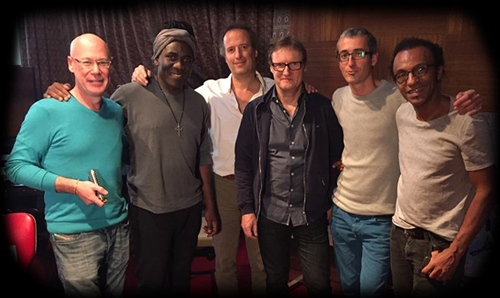 Quentin Dujardin & Ivan Paduart will record in November a new album with Richard Bona, Bert Joris, Olivier Ker Ourio & Manu Katché. Quentin Dujardin’s music from his latest album (Le Silence des Saisons) fits perfectly with videos about the relationship between man and nature. 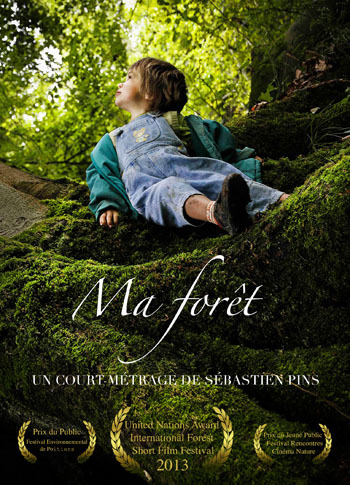 This resulted in the wonderful short film My Forest by Sébastien Pins. The movie has received more than 16 awards and over 100 festival selections around the world. Including an award by the United Nations (US). Quentin Dujardin will be at Brosella Festival (BE) with Ialma on July, 11 & at Mission Folk Festival (CA) between July, 22 & 26. Read now his last interview for The Georgia Straight (CA). 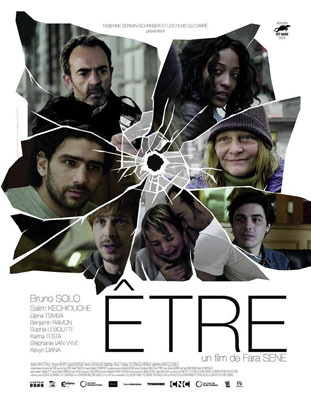 Quentin Dujardin composed with Soléa García-Fons the soundtrack of the film credits for the movie Etre by the french director Fara Sene with Bruno Solo & Salim Kechiouche. Movie release in France & Belgium on June, 10. Listen to the soundtrack now! 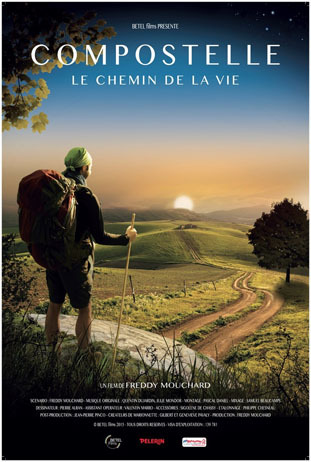 The movie Compostelle, le chemin de la vie (Freddy Mouchard 2015-FR) makes its release in France this April 1. An original soundtrack composed by Quentin Dujardin & Julie Mondor. 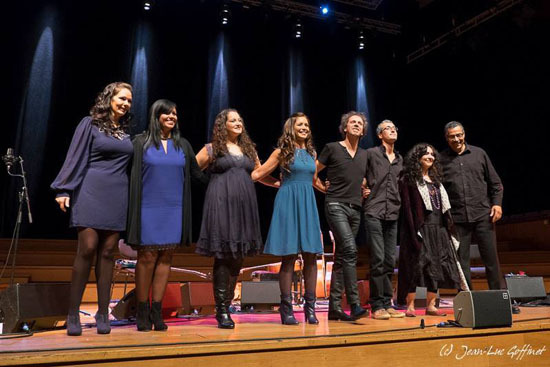 Le silence des saisons Tour continues... Do not miss the exceptional concert at the Royal Theatre of Namur on March 7, 2015 with special guests Mahsa Vahdat (vocals-Iran) and Ialma (vocals-Spain). 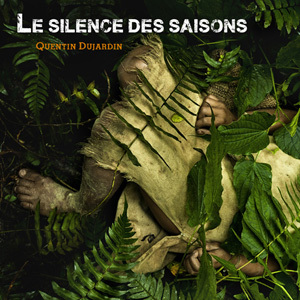 Le Silence des saisons, the new album of Quentin Dujardin is now available through the official website and also in digital version (iTunes, Amazon,...). Make your order now! Discover the clip Baritone, from the new Quentin Dujardin's album. A shortfilm directed by Antoine Lanckmans with Baptiste Moulart. This work will be presented as World Premiere at Maine Outdoor Film Festival 2014 (US) this Saterday, 23 Augustus and at the Berlin International Short Film Festival this next October, 29. 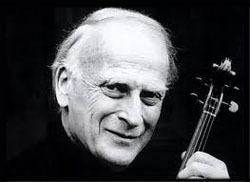 Quentin Dujardin will play a special concert filmed and recorded with the french countertenor, Samuel Cattiau and Matthieu Saglio (cello) on next June 21 at the Church of Mont-devant-Sassey (FR). Please book your tickets now! The Belgian national radio RTBF will broadcast this December 27, 2014 at 8 pm the concert of Quentin Dujardin and Iranian singer Mahsa Vahdat at the Art Festival 2013 of Huy (BE). 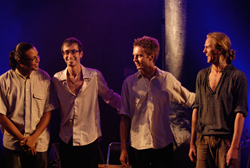 They played alongside Olivier Hernandez (harmonica) and Nicolas Fiszman (bass). 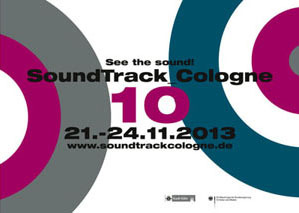 The original soundtrack from the shortfilm Ma Forêt composed by Quentin Dujardin is featured at the prestigious Festival Soundtrack_Cologne 10 (GER). The Awards ceremony will take place on November 23. Quentin Dujardin is currently composing the original soundtrack of the next Isabelle Detournay's exhibition untitled Ousteri. This will take place as part of Europalia India from November 23 to December 22, 2013 at Château Gilson (La Louviere-BE). Quentin Dujardin creates a new musical series entitled Legendary Landscapes. Through a new musical & virtual collaboration, this will present short stories. Discover now the very first episode with Robert Redford. Congratulations to the film crew of the shortfilm My Forest, which has won two new Awards: Best International Short Film at the International Film Festival Kuala Lumpur 2013 (Indonesia) & Best Narrative Short at the Downtown Tyler Festival 2013 (USA). An original soundtrack by Quentin Dujardin. 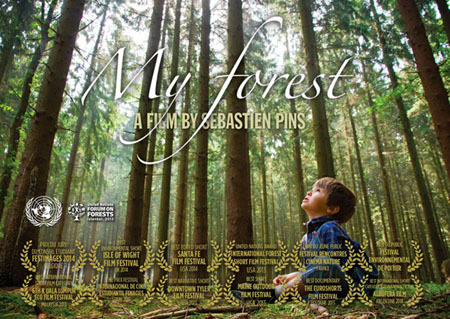 The short film My Forest by Sébastien Pins won a Award at United Nations International Forest Short Film Festival 2013. Watch the movie now. 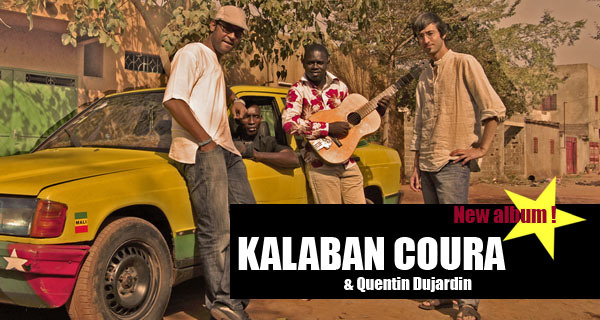 Quentin Dujardin & Kalaban Coura are back for a Belgian Tour this month. Check all the dates by clicking on the picture. 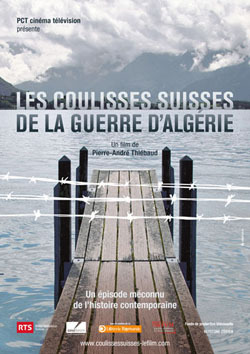 Quentin Dujardin is currently working on the soundtrack of the documentary film, Les coulisses suisses de la guerre d'Algérie by Swiss director, Pierre-André Thiébaud. Listen to some tracks by clicking on the picture. The documentary movie will be released soon on the RTS (Radio Television Swiss). The song 1977 from the new album Distances opens the new Putumayo compilation (US) among other great artists such as Geoffrey Oryema or Sona Jobarteh. 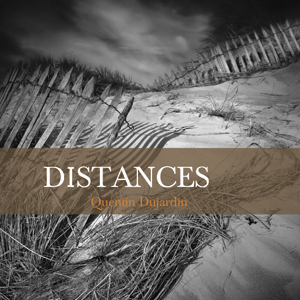 The new album DISTANCES is now available on iTunes & Amazon. In stores from October, 15. The documentary movie "On the way" about Quentin is selected by the Festival Culture unplugged (USA). Watch now the movie by clicking on the picture. 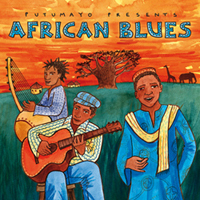 The compilation African Blues No. 4 (Putumayo/Naxos) will be released this April 24. Read now the interview with Quentin Dujardin about Kalaban Coura for the American label. Kalaban Coura & Quentin Dujardin are selected for The German Records Critics'Award. Kalaban Coura is now on The World music Charts Europe. 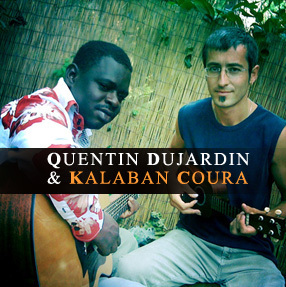 The great musical meeting between Quentin Dujardin (Belgium) and Kalil Sidy Haïdara (Mali). Kalaban Coura's new album is now available. Click on the picture to enter the website. Quentin Dujardin will be in concert at the Philarmonic Hall of Kosice (Slovakia) with Voices for Tomorrow for the International Yehudi Menuhin Foundation. 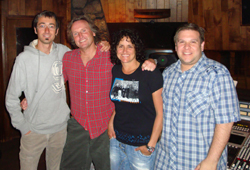 Kalaban Coura will be mastered in September by Greg Calbi at Sterling Sound (NY). Quentin Dujardin will be in residence at the Castle of Laclaireau (BE) with the french countertenor, Samuel Cattiau. They will work together on an original repertoire based on lyrics coming from Early music (de Machaut, Dowland). Quentin Dujardin will be in residence from May 24th to 28th in Tapovan (Normandy-FR) for the project Voices for Tomorrow sponsored by the International Yehudi Menuhin Foundation. 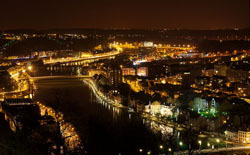 Quentin Dujardin received in his hometown, Namur (Belgium) the award "Artist of the Year 2010". Quentin Dujardin will be on tour in Flanders with Jalal El Allouli (vocals & Arabic violin), Tuur Florizoone (chromatic accordion) and Fred Malempré (percussion). 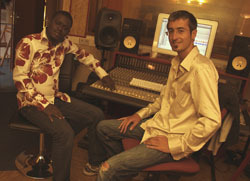 The album Kalaban Coura is currently being mixed at Studio Fantasy (Berkeley-US) with the producer, Lee Townsend.